Description: Enjoy this wonderful pudding made with ingredients that you might not have thought of! Directions: Mix ½ cup of strawberry concentrate with ½ cup of water (1:1) and set it aside. 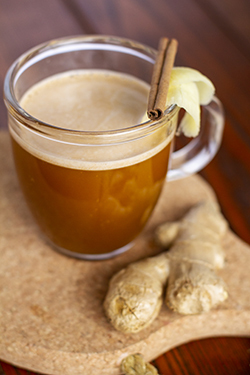 In a separate container do the same with ½ cup of carrot/ginger smoothie and ½ cup water (1:1). Add ¼ cup of chia seeds to each mixture. In a separate container, add ½ cup of chia seeds, to 2 cups of Califia Oat milk and stir in the honey to sweeten it. Let all of the mixtures sit for at least 30 minutes (but overnight is best). 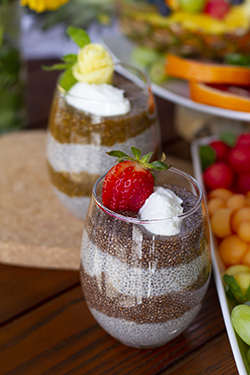 Finally in 2 separate glasses, layer the three chia pudding mixes and top it with some whipped coconut cream to your liking. 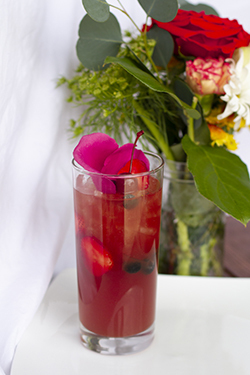 Description: A mixed fruit drink with vinegar, this “shrub” contains cherry and cranberry to add clean sweetness and rose for a floral finish. Blended with Dr. Smoothie Wildberry Hibiscus Refresher, it also offers a caffeine kick to help you make it through the day! Directions: Pour all ingredients into a shaker and top with ice. Shake gently and serve. Description: This tart and creamy mousse is perfect for a mid-day dessert! Though unique and a little unconventional, this delicious treat can be easily made with the standard cafe products already on hand. Directions: In a small cup dissolve the Cafe Essentials Organic Madagascar Bourbon Vanilla in a little hot water to make a paste. Next, combine the paste and all of the other ingredients in a Pint Capacity iSi Cream Profi. Seal the profi according to the iSi Profi Instructions, add a fresh iSi N2O Professional Cream Charger and shake vigorously. 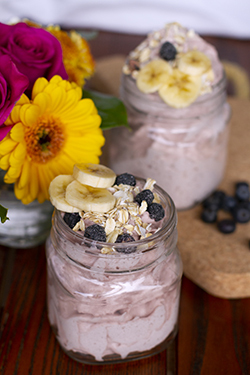 Dispense the mousse into small cups and top with a sprinkle of oatmeal. Description: Cocktail meets popsicle in this perfect marriage of spicy and sweet. Cocktail: Start by filling a popsicle mold with the Dr. Smoothie Blood Orange Refresher. Let freeze until firm. Rim your glass by first dipping it into a saucer with honey and then into another saucer with tajin. Next, muddle together 2-3 slices of jalapeno (based on spice preference) with sliced blood orange and lime. Pour a shot of tequila over the muddled ingredients, add the popsicle and top with soda water. 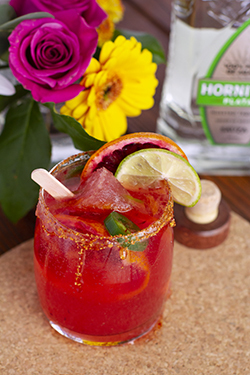 Garnish with lime and blood orange. Soda Water: In an iSi Soda Siphon (quart capacity), fill the siphon with water, firmly attach the lid, load a charger and give it a good shake (see the iSi Stainless Steel Soda Siphon Usage Guide & Safety Brochure). Description: Smooth carrot and apple cut with spicy ginger will have you moonwalking back for more. Directions: Pour the Bhakti, Dr. Smoothie and water into an iSi Nitro Whip. Firmly attach the lid, load a N2 Nitro Charger and give it a good shake (see this How to use iSi Nitro Whip Video) Dispense into a mug and garnish as desired. 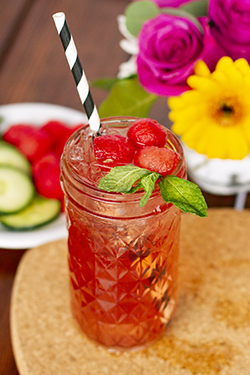 Description: This pony show favorite gets a fresh twist with a watermelon kick! Cocktail: Muddle the mint in the bottom of the glass then fill the glass with crushed ice. 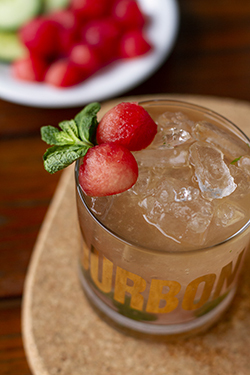 Pour in the bourbon and Dr. Smoothie Watermelon Cucumber Refresher. Top with soda water and garnish as desired. Description: This refreshing, fruity blend of pineapple, coconut and rum perfectly channels those tropical beach vacation vibes. Optional Garnish: Top with Coconut Whipped Cream, Savory Spice Shop Nutmeg and Stirling Flavors Toasted Coconut Shakeable Topping. 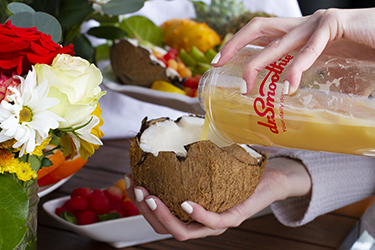 Serve in a mini coconut. Cocktail: In a cocktail shaker, combine all of the ingredients. Shake vigorously to mix, then strain into your serving glass (or coconut). 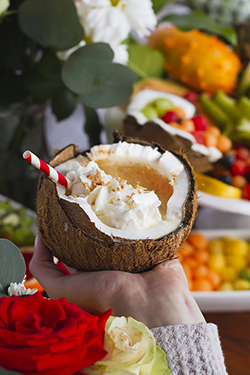 Garnish with coconut whipped cream, nutmeg and toasted coconut shavings. Coconut Whipped Cream: Pour 2 oz. of 1883 Coconut Syrup and 2 cups of heavy whipping cream into the iSi Profi (quart capacity). Seal it according to the iSi Profi Instructions, add a fresh iSi N2O Professional Cream Charger and shake. 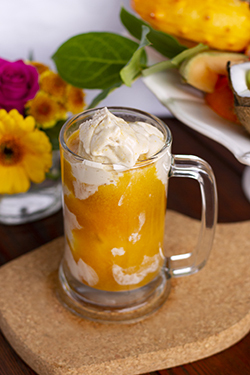 Description: Dreamy, creamy, citrus bliss, this sunny soda float is the real fruit rendition of that iconic summer treat. Directions: Prepare soda water in an iSi Soda Siphon (quart capacity): fill the siphon with water, firmly attach the lid, load a charger and give it a good shake (see the iSi Stainless Steel Soda Siphon Usage Guide & Safety Brochure). Next, add 3-4 scoops of vanilla ice cream (about 6 oz.) to the serving cup. In a separate cup, combine the sparkling water and smoothie concentrate and stir. Pour the mixture over the ice cream and enjoy! Description: This smoky yet spicy twist on a classic Old Fashion is the perfect mocktail (or cocktail) to accompany your warm summer nights around the campfire! • Optional: To make the drink a cocktail, substitute 1 oz. of coconut water with 1 oz. of bourbon. Optional Garnishes: Blood Orange and Ginger Zest, a Maraschino Cherry and a Blood Orange Slice. Directions: Combine all ingredients in a shaker with ice and shake. 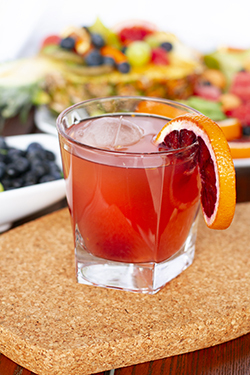 Pour into your serving glass and garnish with a Maraschino cherry and slice of blood orange. Description: Warm weather is coming our way and this flavor-packed, Tropical Sangria is the perfect, quick solution for your new favorite summertime beverage! 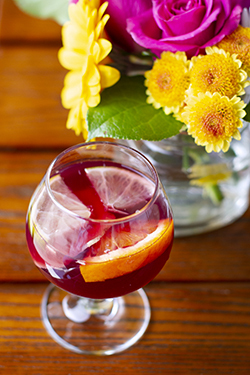 By using a refresher for the fruit element in this sangria, you are able to get an amazing fruit flavor without having to let the mixture sit for such a long period of time. Directions: Combine all of the ingredients in a pitcher and serve! Description: Whether you are on the go, or laying out in the sun, this refreshing, caffeinated beverage is great for the warm summer days ahead! Directions: Combine all of the ingredients in a shaker and shake. Pour the mixture into your serving glass and garnish as desired!